Imagine this. A religious leader—his name is Jairus—has just received the worst news that any parent could hear: “Your daughter has died.” These words strike terror in his heart, are too real to deny. He turns to Jesus, who says, “Do not be afraid; just have faith” (Mk 5:36). Jesus knows what he’s all about. First, he drives fear from the man’s mind, and then tells him to replace the fear with faith. Jesus is remembering the Book of Wisdom, which says, “God did not make death” (Wis 1:13), and in his mind, God’s power is stronger than death. But that was then. This is now, and we live in the twenty-first century, where faith comes with the push of a button and we all want to live forever. True, God formed us to be “imperishable,” but the Wisdom writer was talking not about the body but about the soul. Our souls can never be separated from God because he created them and through our souls we live out our divinity even while imprisoned by our humanity. Another hard truth of life in the 21st Century: public worship ‘isn’t what it used to be’, isn’t very popular, and in some places, —even in the United States of America—expressing belief that Jesus is Lord can get you ridiculed, expelled from school, fired from a job, divorced, or arrested. Nope, it just isn’t “cool” to be a disciple of Christ, at least, not outside of Church. Certainly, that’s the mentality of the crowd. In Mark’s gospel, the followers of Jesus are curious about his works and in his words. Why are they following him? He must have something that they want. They want to live forever, but on earth, not in heaven. Regardless, he works around their disbelief. He performs his miracles—raising Jairus’s daughter, curing the woman with the hemorrhage—in the open, for all the world to see. The disciples don’t understand. They press in on him like “rubberneckers,” people at an accident scene who watch the paramedics treat the victims but they don’t want to get involved. They think, “I’m glad that’s not me.” They fail to believe in the miracles even when they see them with their own eyes, nor do they believe in God’s grace. Instead, Mark describes their response: “And they ridiculed him” (5:40). Not Jairus. 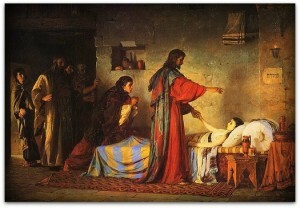 Jairus goes to Jesus because he believes that Jesus is capable of curing his daughter. Grace—something the man could not have asked for because he didn’t know it existed (because grace comes only through Jesus Christ)—led him to seek the Lord in desperation. The faith that we express, publically and privately, happens because of God’s grace. This doesn’t mean that we’re not going to die, that we won’t experience the mortal pain we feel over the death of a loved one. But perfect faith leaves no room for fear, over the death of others, or our own death. At her trial, Saint Joan of Arc, the fifteenth-century French martyr, was asked by her captors whether she was in God’s grace. She responded, “If I am not, I pray that God will put me there; but if I am, I pray that he will keep me there.” Then they burned her at the stake. Joan was prepared to meet her God because the faith she felt was greater than her fear of what prevented her from seeing him. God made us to live forever, not in the body, but in the soul. The proof are the works of Christ, who, despite our skepticism and fear, works around our disbelief. Don’t be afraid to seek him as did Jairus, or to tell others what he has done. Don’t follow the rubberneckers. Just have faith.